"The advance in technology has offered the advantage of instant color copy machines which are available in many easy to access locations. 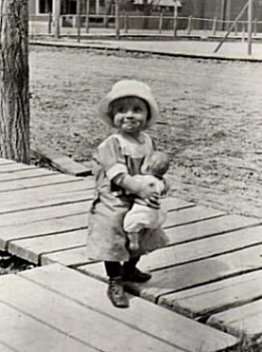 Antique and older photos can be duplicated at a minimal cost, so don't hesitate to ask family, friends, and associates if they have any pictures of children holding dolls that they will allow you to borrow." Discarded photos of the family of the distant past may also be purchased at antique shows, flea markets, and antique malls. 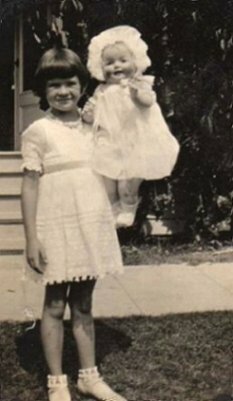 The immediate attraction was due to her array of different tea party friends, but it became even more intriguing after my mother pointed out her striking resemblance to myself as a child. It took many years to convince her that the picture was not of me.......but of a kindred spirit many years prior. I guess there was a strong resemblance. 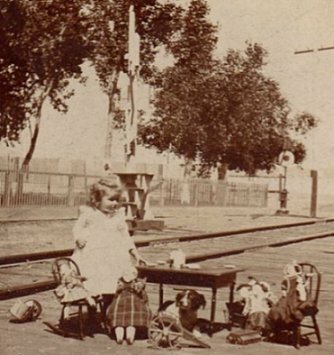 I can not think of a more pleasant childhood than to have many dolls to entertain.......near trains that pass swiftly to unknown destinations nearby. 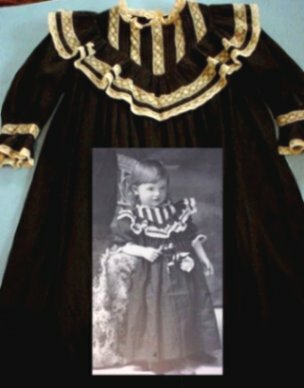 An acquisition of an antique photograph along with the garment worn by the child is a very rare treasure. Items this closely tied to family history are generally obtained from the family itself. This portrait of a young child wearing a black dress is even more delightful as it is not an image of a girl......but of a young boy. 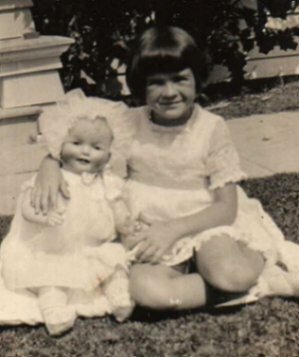 The dress can be worn by a large antique doll with the photograph displayed nearby. The sense of family history is preserved as well as the enhancement of doll display.